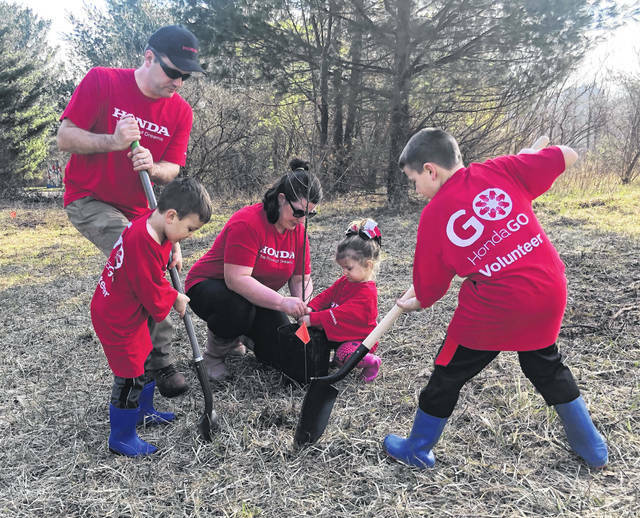 Father Ryan Johnson, left to right, son Mason Johnson, mother Melissa Johnson, son Reagan Johnson, and son Keiden Johnson help plant a tree at YMCA Camp Willson in Bellefontaine Saturday. Ryan works for the Anna Honda plant. Taking part in the tree planting dedication ceremony were, left to right, Lisa Shoupe, Linda Rosine, Heather Graham, Tom Shoupe and Ben Stahler. 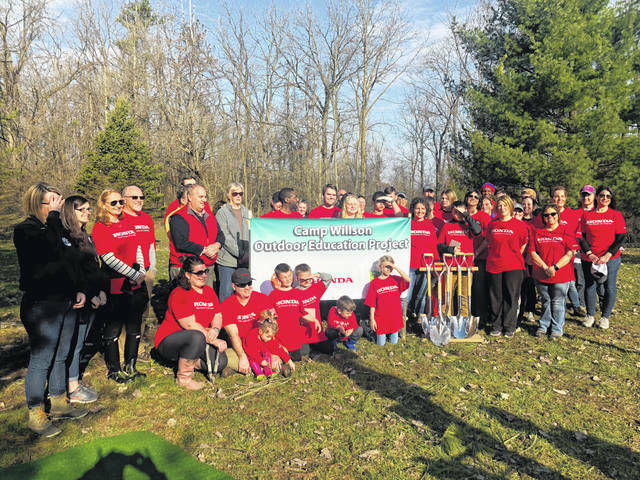 Honda associates and families helped with the tree planting ceremony at YMCA Camp Willson in Bellefontaine on Saturday, April 6. 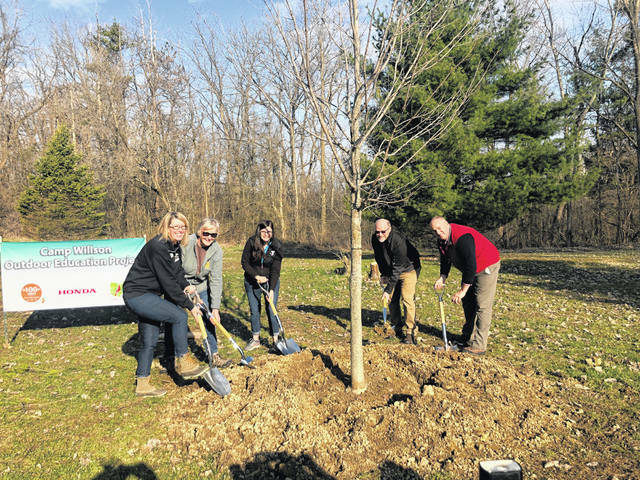 BELLEFONTAINE – With a $15,0000 donation to a Keep Ohio Beautiful sugar maple tree-planting program at the YMCA Camp Willson, Honda of America passed the $100 million mark in philanthropic contributions to Ohio communities. Camp Willson is located near Bellefontaine Ohio. Tom Shoupe, executive vice president, Honda of America Mfg, said this total includes more than $58 million in corporate contributions, $28 million from Honda associates, and $14 million from the Honda of America Foundation in Ohio. He also noted that Honda associates have played a key role in carrying out community initiatives as well, donating over 100,000 hours of time and talent. For the Camp Willson project, approximately 35 Honda associates and their families were on-site to plant the 100 sugar maple and other hardwood trees that are the beginning of the camp’s new arboretum. Linda Rosine, Board President of Keep Ohio Beautiful, said that the donation allowed the Camp Willson staff to realize their visionary plan to create the start of a sugarbush, teaching today’s kids and future campers how to steward the land and realize the benefits of sustainable agriculture. Keep Ohio Beautiful is a 501(c) 3 non-profit which has the goal of allowing everyone in a safe and clean environment. Bellefontaine mayor Ben Stahler said Honda’s generousity to the 500 acre Camp Willson project supports a 100 year old facility with 350-year-old oak trees and a 40 acre pond left over from the last glacial period14,000 years ago.